ALDI Special Buys Women's Clothing and bedding products are viewable on the preview page ! Don't miss out this great chance at ALDI Catalogue in Wednesday ! Have these high quality bedding products which you can see on pg 2&3 and apparels for winter on pg 6&7. ALDI offers great variety of casual wearing and accessories for ladies who are looking for alternative prices and high quality material. It may be a handicap that these are available only on WED but these prices are really rare. This is not the limit for ladies. See new cosmetics of Lacura on pg 8&9. I think It is a good idea to list some of the bedding products on pg 2-5. Quilt cover set queen size $59.99 pg 2. Create a great wardrobe for this winter with spending the least amount of your budget. This is the trend and if you like it you can have it with the perfect prices at ALDI stores in WED 8 July 2015 ! ALDI Special Buys beauty products 8 July 2015 prices are viewable on the preview page. ALDI Catalogue beauty products are famous. You can check out the latest ALDI price for Lacura beauty products, skin care, foundation creams, moisturizing creams, Protane shampoo and conditioner and even more products. These special products are here to protect your skin from winter. In winter weather can be harsh due to the weather getting colder. Being in and out makes a thermal danger on your skin. But it is easy to protect yourself. Since your skin will be in lack of water you are going to have to use moisturizing creams. They are available in the ALDI Special Buys Week 28 catalogue. ALDI Catalogue offers the best prices of this month. This is another nice product repairing the skin tending to be destroyed partially. Anti-ageing creams helps cells of your skin build up new tissue with its nutritious ingredient. See mascara, lipstick, foundation creams on pg; 8. 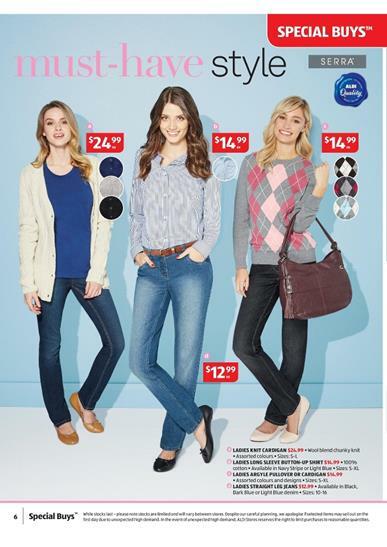 Knit wear, lingerie, accessories and even vest are available at special buys range of ALDI Catalogue. Check out pg; 6&7 for all products of the women clothing for winter. Great prices, top quality material. ALDI Catalogue Special Buys Week 28 sale covers home products such as bedroom products, bathroom decoration products, professional tools, furniture, household items and grocery products. You can browse it on the preview page of the catalogues. New catalogues of ALDI, Target, Kmart are always available with new reviews every week. This week ALDI offers new beautiful bedding products. Browse a new featured price range for the quilts, sheet set, some furniture, storage products and even more. Secondly women's clothing and underwear products are available on the latest ALDI Catalogue. Find a beauty and health product range for the new season. Lacura cosmetics and Protane shampoo are special buys of the first week of July 2015. Renew your design in living room and add color with the perfect ligthing products which you can be purchased for very special prices at ALDI stores in 11 July 2015. Professional hardware range of ALDI Catalogue is also on sale in 11 July. There is power tool set, metal cut off saw, Workzone remover set and many more products. Find a great range of products at ALDI Stores. With a nice special price range you will have no difficulty in selecting one of them. Quilt cover sets, cotton sheet sets and soft blankets new prices pg; 2-3. New bathroom towels and bathroom essentials on pg; 4. Acrylic soap dispenser deals on pg; 4. Bedside table, drawers, table lamp variety on pg; 5. Ladies' clothing including jeans, sweater, shirt, knit wear and more on pg; 6. Accessories including handbag, lingerie, stocking on pg; 7. See new Lacura cosmetics, skin care items, make up products and Protane shampoo products on pg; 8-9. A great range of decorative products and furniture are available. That includes accessories for your wall and decorative spots in your living room or hall. Check out new lighting products and storage solutions on pg; 10&11. Power tools, hand tools and accessories for the Workzone hardware products are available on pg; 12&13. A great selection of these can be your first choice to have a look. You might get interested in ladders on pg; 14&15. ALDI Catalogue Special Buys Week 27 June 2015 including great randomness of the essentials, entertainment, some books, American treats, snacks and their amazing prices. 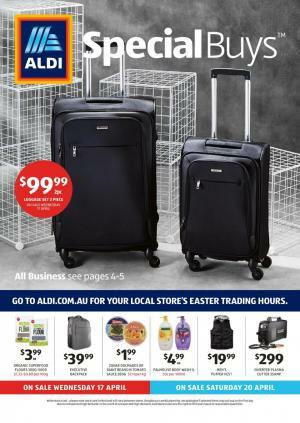 ALDI Special Buys Week 27 travel products are available on the pg; 2 featuring great price range of the luggage that are essentials during your whole journey. ALDI Catalogue included home appliances, Crane sports products, outdoor essentials, vests for hiking, and leggings for ladies. Please go to the pg; 12-13. ALDI Catalogue sells great products for kids. Entertaining educational products for kids, books, some electronics are available in the pg; 2-3. Check out the details about the ALDI products. Onix Kid 7" tablet $69.99 pg; 3. ALDI American treats such as Hershey's chocolate bar, Arnott's krackel, Oreo biscuits are available in the pg; 4. ALDI travel supplies are spinner suitcase, special buys of products of high quality road companions. See the top quality products of these and make profit out of this shopping. Last week of Jun 2015 with ALDI Catalogue special buys week 26 is a week with high end joy of shopping at ALDI stores. ALDI offers a great range of kitchen appliances that we all are used to work with it. Very good quality electronics, smart phones, notebook by Bauhn with Windows OS. The smart phone of what Microsoft developed for you in this year is also on sale at ALDI stores. Check out the details about the ALDI prices for the new aisle of products of specials which you can happen to be seeing on the catalogue. ALDI Catalogue prices are excellent to shop for and you could make profit out of this shopping with savings. ALDI special buys week 26 pg; 2-3 contain new cook ware prices including non-stick surface fry pans with new materials. Check out prices of the latest products at ALDI online catalogue. A quick and practical solution for cooking, preparing food, processing food and bunch of categories of drinks are possible with these devices. Jamie Oliver books containing the newest recipes of delightful meals. ALDI offers prices that are better than electronic stores. You can find latest technology of notebook, smart phone, tablet PC and simialr products for fair prices.